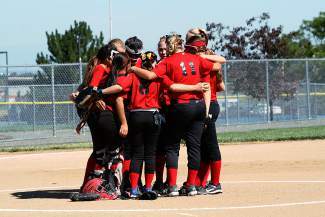 Members of the Three Rivers Junior Girls Softball team hudle at the mound during their winning outing at the Colorado State Tournament last week. GYPSUM — Right about now, every Three Rivers Little Leaguer wants to play like a girl. A juniors softball girl, to be precise. That’s because TRLL Junior Girls Softball team (ages 13-14) is headed to Santa Fe, New Mexico, to complete in the regional tournament. Their tournament appearance comes a week after the team took the Colorado state title earlier this month. It marks the first time a squad from the Three Rivers program has advanced to regional play. Starting July 24 and continuing through Tuesday, the team is completing in a double elimination tournament featuring winning squads from east Texas, west Texas, Louisiana, Arkansas and New Mexico. Team manager Jason Vargas together with coaches Rick Needham and Cathryn Reynolds have been working with the all-star squad since mid-June when they assembled the 11-player roster. Eight of the girls reside in the Gypsum area while the remaining players come from all reaches of the Three Rivers boundaries — which extend from Eagle to Glenwood to Aspen. The team earned their district title by besting Delta and then swept the state tournament held in Arvada last week. Vargas said the team has strong defense and solid pitching. And they are also teenage girls — which means that while they play hard they also giggle a lot. “They make me laugh, too. They are fun to be around and there is never a dull practice,” Vargas said.